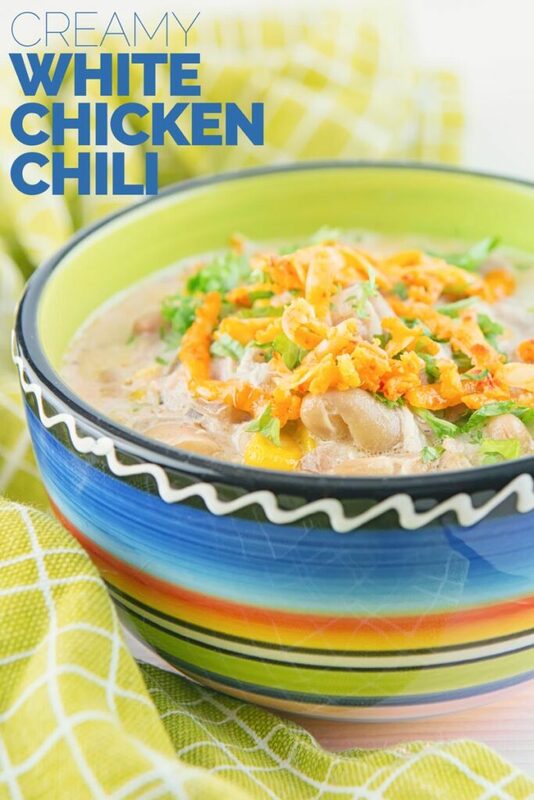 I’ve long been intrigued by the ideas of a creamy white chicken chili, so I went ahead and worked on my own version of this unusual spicy treat! 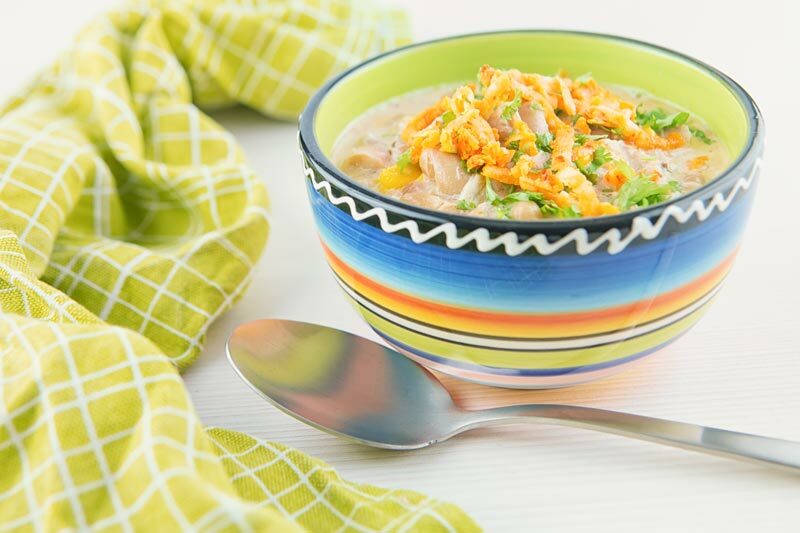 I’ve seen lots of white chicken chili recipes over the last few years and I have erred between scorn and intrigue. A few months ago I figured I would give it a try. I was pleasantly surprised and have spent the last few weeks working on tweaking my approach to work in a slow cooker. It took me almost two years to put my regular beef chili recipe up here and now I have a whole new one this year too. It still feels a little unusual having lots of the same flavours associated with a beef chili combined with a creamy chicken sauce but I love it. Whilst working on this recipe I even found some Monterey Jack Cheese. Now I am sure it was just the stuff I found here in rural Hungary but it was disgusting and went in the bin. I went with some Red Leicester cheese instead. Slow Cooker Recipes For Two. Cooking in a slow cooker for a smaller family is often a challenge. They are very much geared towards feeding four or more people. As a result, all of my slow cooker recipes either work wonderfully well the day after. My slow cooker Chicken Cacciatore recipe is a perfect example of this. Or I ensure that the recipes that I make for the slow cooker freeze really well. Just like my slow cooker wild boar stew! So what about this recipe? 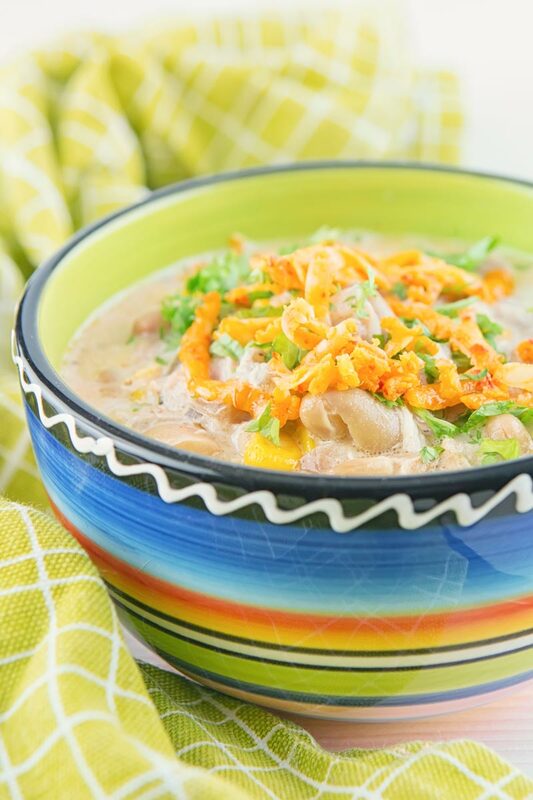 Can you freeze white chicken chili? The answer is that this recipe works both ways. Either freeze it or eat it the following day. If you freeze take it out of the freezer the night before you eat it. Then allow it to defrost before gently reheating. 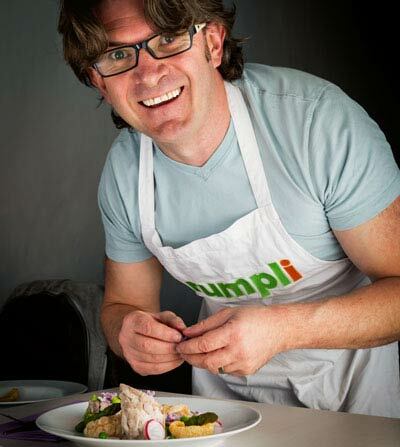 I personally prefer to eat it the day after as the flavours develop and become more complex on the second day. Coriander and cumin are the dominant flavours in this recipe. Apparently, there are ‘real scientific’ reasons for some people not liking coriander. That ‘scientific’ reason is that they are mad and those people should not be trusted, hehehehehe. Just kindding… Or am I? Anyway you have been warned! 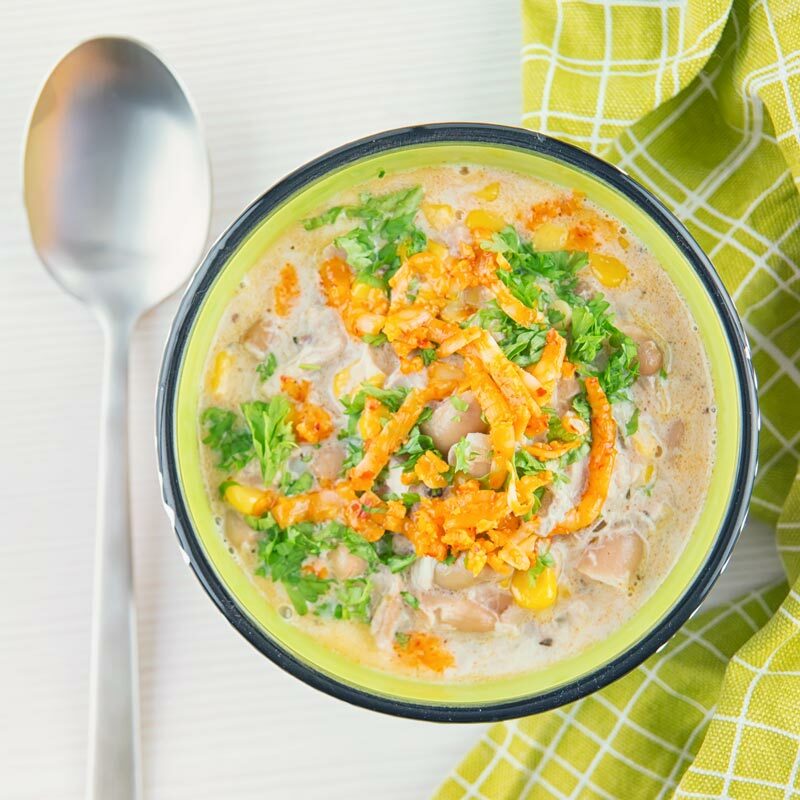 I've long been intrigued by the ideas of a creamy white chicken chili, so I went ahead and worked on my own version of this unusual spicy treat! Layer the onions on the base of the slow cooker and add the chicken thighs on top. Now sprinkle over the garlic, chili, white beans and sweet corn. Mix the coriander, cumin and cayenne pepper with the chicken stock and pour over the food and then cook on high for 4 hours or low for 8 hours. After 4 or 8 hours dig out your chicken thighs and strip out the bone, remove the skin and shred before returning to the slow cooker. Pour in the double cream and sour cream then mix and bring back to temperature. Serve topped with cheese and chopped coriander leaves. The amount of salt in this dish will be very much defined by your stock, so use your own judgement. However try and add the salt as early in the cooking process as possible. 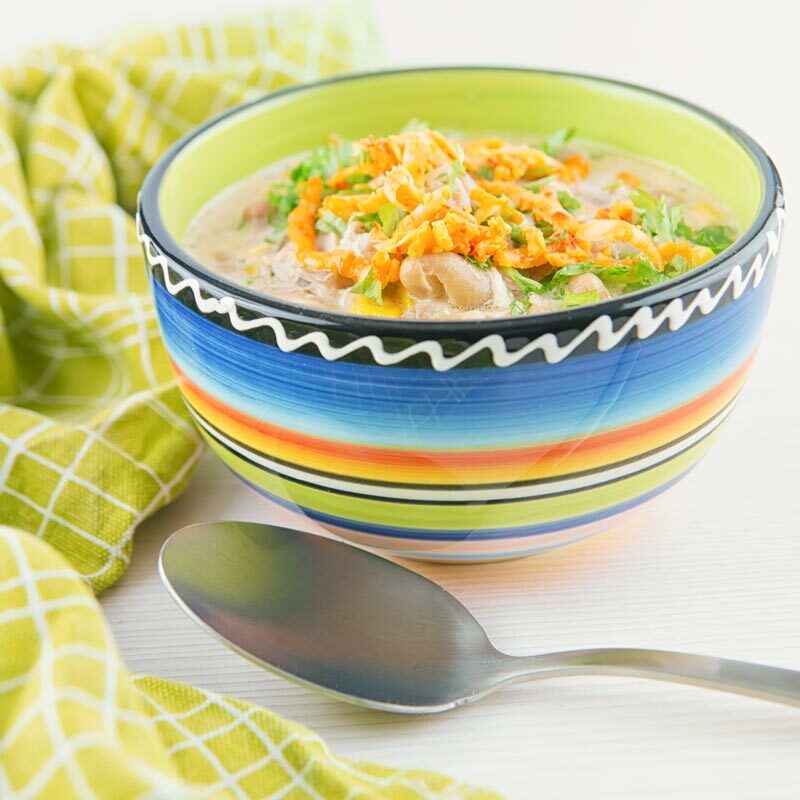 I had never heard of white chicken chili before, that sounds scrumptious, pinned it! They are relatively new to me too but they will be featured much more often on my menu. 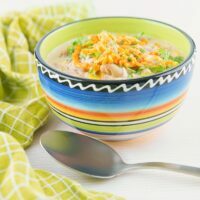 I’ve been meaning to try making a white chicken chilli, this version looks delicious, I’ll have to add it to me list to try! What a delicious comforting idea for dinner! YUM! I’m all about easy, comforting slow cooker dishes like this one in winter. Love all the added toppings for extra texture! Chili is one of my favorites and I do love a godo white chili too. It is very close to the Mexican flavor profiles so this si right up my alley =) Lovely pictures as always. Like the new format on your site looks really nice. Thanks Adriana, it is fun to play wth different flavours.